Following The Country Catalogue's "Oh So Popular Black Lab" blog, we would like to show you how much we equally love Spaniels. Dog lovers and Spaniel owners are bound to find the perfect gift from our Dog Themed Gifts and Homewares collection, whether it be a Cocker Spaniel Hanging Metal Sign or a set of Spaniels Placemats and Coasters The Country Catalogue can help you find the ideal present this Christmas on all types of budget. Working Cocker Spaniels are very popular dogs in the UK. They are small but strong and robust, with high hunting and retrieving instincts. Although popular working dogs, they are equally as popular as house pets for an active family. You may find working Spaniels clingy at times, prepare to be followed when answering the door or making a cup of tea! This highlights the love Spaniels show for their human companions. If you're looking for the ideal Greetings Card this Christmas for Spaniel lovers and owners, look no further than The Country Catalogue's Cards and Stationary collection. Springer Spaniel Santa Paws Christmas Card features a gorgeous image of a Springer Spaniel wearing a festive hat. The A5 card contains an inside message of "Merry Christmas" and is supplied with a red envelope, all neatly presented in a cello bag. Springer Spaniel Santa Paws Christmas Card is selling out fast so be sure to buy one quickly in time for the festive period! Lucy Green Designs - Spaniel Mug is the perfect stocking filler for Men and Women this Christmas. Part of the Lucy Green Designs Country Sporting range, this fine bone china mug features a green Springer Spaniel on each side, with a single small Spaniel and tracks inside. Mini Tray - I Spy Peeping Spaniel is also ideal tableware to your country home, measuring 21.5cm x14.5cm the tray is just the thing for serving tea and biscuits with. Looking to spend that little bit extra? 6oz Square Hip Flask - Springer Spaniels features a stunning image of a pair of Springer Spaniels embellished on front, is made from stainless steel and presented in a gift box, with a small funnel for easy filling. An ideal gift for shooting enthusiasts and Springer Spaniel lovers! Recently new in is the Puppy Love Greetings Card featuring an adorable and heart warming black and white photograph of a boy holding his Spaniel. The card is suitable for any occasion as you can write your own personal message inside. 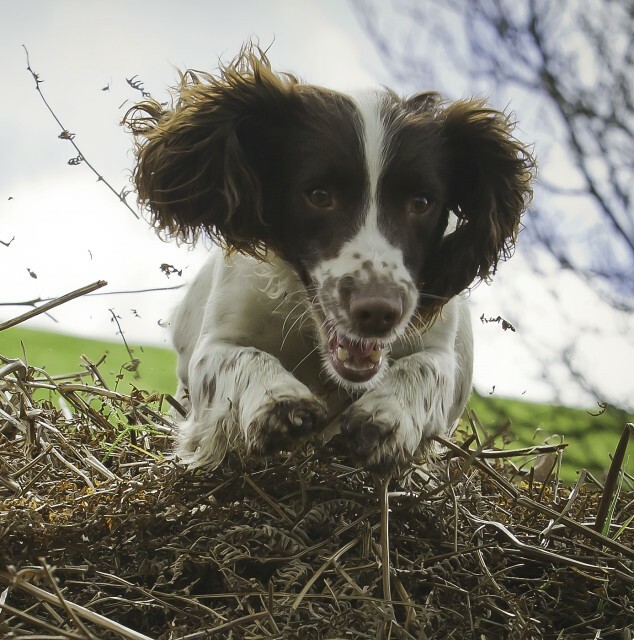 If you require specifically a Birthday card, The Country Catalogue stocks a Springer Spaniel Happy Birthday Card featuring a charming close up photograph of a Springer Spaniel. Springer Spaniel Happy Birthday Card is supplied with a cream envelope and wrapped in a cello bag. The Country Catalogue stocks Spaniels Placemats and Coasters which are wonderful addition to any country themed table. Measuring 33cm x 23cm these placemats are wipe clean and heat resistant to 110 C. Each placemat and coaster is illustrated with a beautiful high quality photograph of a Spaniel and come in a stunning green boxed embossed with gold foil.